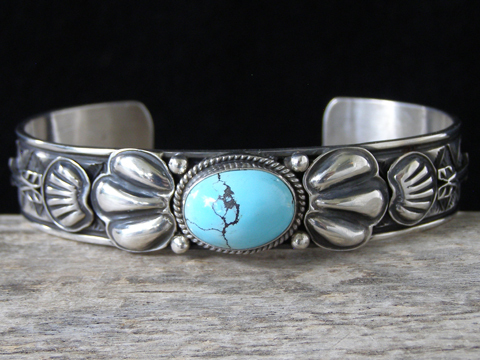 Tsosie White Persian Turquoise Bracelet size 6 3/4"
Navajo silversmith Tsosie White set a classic high-domed oval of natural, untreated Persian turquoise in this uniform width bracelet. This classic Persian high-domed cut is clear blue with threadlike matrix showing like cracks in a bird's egg. He added appliquées to left and right of the stone, arrows in flight and stamped the cuff with traditional motifs. Beautifully decorated in a nice slimline design.